How Nurses Celebrate their Holidays? Christmas is a well-earned holiday for most people. But for Nurses, it’s like any other day surrounded by patients in pain, medication overload and co-workers. The chaos continues despite the festive period. Christmas day? New Year? These are some of the holidays people celebrate around a table of great food and loved ones. During these holidays, nurses walk out their homes with a heavy heart. For them, the grumbling thought of everyone in the world is celebrating while you are in the hospital attending your patients’ needs is frustrating, but it is the vocation you awe to fulfill. In one of the video blogs done by Ashley Adkins, a registered nurse working in the Intensive Care Unit in Mesa, Arizona, she enumerated different ways to cope with working during holiday season. For her and her colleagues doing holidays shifts are just about compromising. They make sure that each staff nurse is able to get a day off during the 3 main holidays in her country namely, Thanksgiving, Christmas day and New Year. She also added the advantage and disadvantages of doing these shifts. When you’re working on holidays, you cannot resist the feeling of being deprived with your family members and friends. Although you may enjoy the company of your co-nurses and patients, nothing can replace being home. The missed memories and weathering the feelings isn’t always easy; good thing you always have your colleagues for mutual support. During the holiday seasons, hospitals try their best to get as much patients and staffs home as possible just so they could spend time with their families. The truth is no one wants to spend the holidays in the hospital; neither the patients nor the administrative staffs. But what about the staff nurses? Celebrating holidays, as well as special occasion such as birthday of loved and even your own birthday, in the hospital is an accepted fact in the nursing profession. We gave up spending these events to make sure that our patients are well taken care for. The work itself is a disadvantage. Instead of enjoying the holidays season, you work like your usual day. This means like you go to work and work like a regular day. The constant thought that you have to work and earn money to keep that steady flow if income conflicts with what was supposed to be a happy and glorious feeling of festive. Nurses follow schedule, and you might not be able to get all the days off you want. Institutions have different policies when it comes to working on holidays. You miss the idea of the celebration. For nurse, going on shifts during holidays makes them feel distant to their own families. It is difficult to think that your family is celebrating without you. Working on holidays might be a shock to rookie nurses; nurses who have stayed awhile in the business have learned to cope with the situation. How to enjoy working on holidays in the hospital? Move your family celebrations to a time that you are not at work. 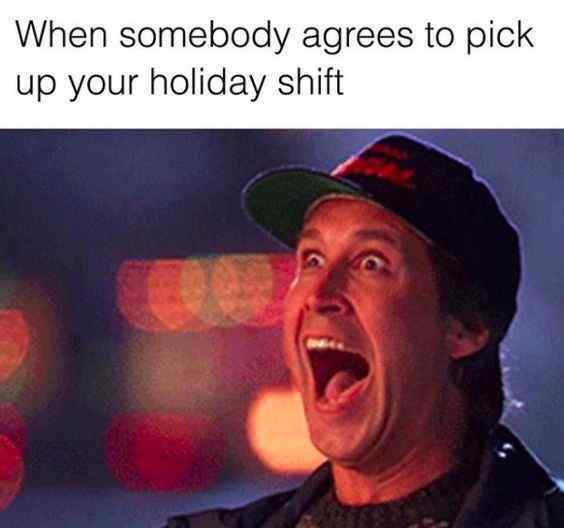 If you are working on Christmas Eve, you might want to move your family celebration before or after shift where you are at the comforts of your family. Don’t hesitate and let your family enjoy fun activities while you are at work. They too should enjoy the holidays. Put on something festive to feel the holidays. As simple as a Santa hat or New Year shades is enough. Make sure that you do this within the dress code of your institution. Bring the festive environment to your workplace by playing songs appropriate for the holidays, like Christmas songs. How about putting up some decoration on your work stations that are injunction with your infection control policy? Plan on how you will be celebrating the holidays with your co-nurses that are duty on that day. Discuss with them the food you would be bringing in to share with everyone. You can even facilitate gift giving among your unit. Include your patients in the celebration of the holidays. While attending to your patients, talk to them about their holiday traditions. More than you, they might be more disappointed that they are not able to go home to spend the holidays with their families, and the fact that they are still lying sick in bed. Working on Christmas and New Year isn’t as bad as you think. The workload tends to feel lighter, maybe because of the festive aura of the people around. Having a good and tight work ties with your colleagues can bring the well-deserved feeling of fulfillment. Although working on holidays may bring emotional dismay to most nurses, some would look at its perks and advantages. Most hospitals offer monetary incentives to their staff who offers their services on holidays. Working on holidays is considered overtime. You may want to ask the human resources department on this matter. Knowing this might make you forget the huge gifts you get on and Christmas and the roast turkey on thanks giving. Are you the kind of nurse who always wants to look good and have a good name in front of the administrators and co-workers? 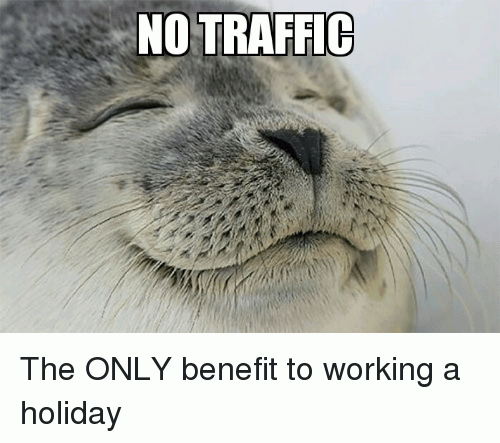 Then working on holidays might do you some good. If you are not planning to go on a trip, you can volunteer doing a shift for other nurses. It would make you an amazing co-worker and it would make someone else’s holiday brighter. Would you like to take a bite of the best specialty dishes by your co-workers? Going on holidays shift give you the chance to taste your co-nurses’ cooking. Wouldn’t you like to take a big bite of that big turkey in the break room? Or enjoy a sip of butter beer on Christmas Eve? While celebrating the festive, get to know your co-workers better. Although hospitals are open 24/7, they too have their down days during the holidays. The number patients seeking care in the hospitals are significantly lesser during festive seasons, allowing nurses to have a smaller nurse-patient ratio. This means less procedures and appointments. If you live in countries that suffer from commuter traffic, you may notice the clear roads on Christmas mornings. You will enjoy the fast and peaceful drive going to work, mostly because people are still in bed or just the fact that they don’t have to work on Christmas morning. Holiday working is an inevitable part of our nursing career. You should look at it as a privilege rather than a burden because it will just ruin your holiday spirits. It is easier to think that nurses work on Christmas because they care, same goes for all holidays. Patients rely on you 24 hours 7 days a week and you, as a nurse, want to be there for your patient. The holiday traditions will not be neglected and set aside just because of work. You can always incorporate these festive traditions to your work in different ways you can, as the institutions allow. A good working relationship with your co-workers, nurses and other members of the healthcare team, are enough to be called family. Such care and love within the team will uplift the holiday spirits that each deserves. Will you be working through Christmas or New Year’s Eve this year?